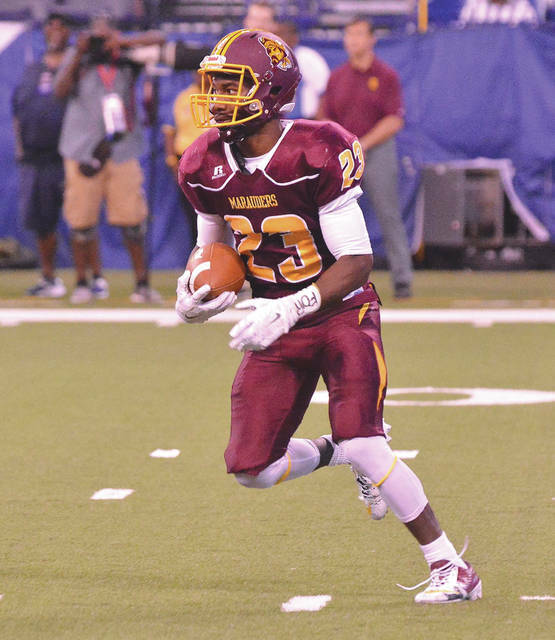 Terraris Saffold of Central State returned a kickoff 85 yards for a touchdown, in Saturday’s Sept. 23 Circle City Classic college football game in Indianapolis, against Southern Intercollegiate Athletic Conference rival Kentucky State. INDIANAPOLIS — Central State fell behind early and couldn’t catch up in a 34-22 loss to rival Kentucky State University in the Circle City Classic. KSU scored on its first two possessions with a pair of field goals from Turner Warren and then led, 13-0, with 8:55 left in the second quarter after a touchdown pass by quarterback Paul Campbell. On the ensuing kickoff, Terraris Saffold tried to ignite CSU with an 85-yard kickoff return touchdown. For Saffold, it was the second straight week he scored from at least 80 yards out. The Thorobreds responded with a 13-play, 62-yard touchdown drive, ending with Warren scoring on a fake field goal. CSU cut the deficit to 10 at halftime with a field goal by Trevor Teel. KSU quickly re-seized the momentum thanks to running back Brett Sylve. On the first drive on the third quarter, Sylve had runs of 21 yards and 18 yards and then finished the drive with a 4-yard TD run to give KSU a 27-10 lead. CSU quarterback Trent Mays, who entered the game as the passing leader in the Southern Intercollegiate Athletic Conference, connected with Lavon Meeks for 31 yards to move CSU to the 2-yard line, and then Darien Nelson broke a tackle to score on the next play. A missed extra point made the score 27-16 with 6:38 left in the third. KSU (2-2, 1-0 SIAC West) later scored when a snap went over Mays’ head and was recovered for a touchdown. CSU scored on its next possession as Mays rushed for a 20-yard touchdown. KSU successfully recovered the ensuing kick and ran out the clock. The KSU offense totaled 475 yards compared to CSU’s 224. The Marauders (0-4, 0-1 SIAC West) visit Benedict College, on Saturday, Sept. 30, in Columbia, S.C.
https://www.fairborndailyherald.com/wp-content/uploads/sites/50/2017/09/web1_TarrarisSaffold_PS.jpgTerraris Saffold of Central State returned a kickoff 85 yards for a touchdown, in Saturday’s Sept. 23 Circle City Classic college football game in Indianapolis, against Southern Intercollegiate Athletic Conference rival Kentucky State. Submitted photo. Compiled by Scott Halasz. Information and photo courtesy of CSU Sports Information Director Nick Novy.